There is no doubt that there are more harmful algal bloom (HAB) events, occurring more often, in more places and lasting longer than in decades past. 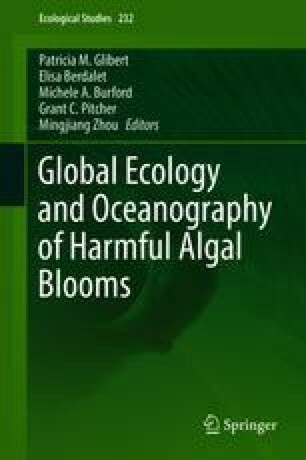 This volume synthesizes the research and activities that took place during the nearly two decades of the international programme on the Global Ecology and Oceanography of Harmful Algal Blooms (GEOHAB). The central challenge for GEOHAB was to understand the critical features and mechanisms underlying the population dynamics of HAB species in a variety of oceanographic regimes. GEOHAB fostered research that was multi-faceted, multidisciplinary, international and within an oceanographic context. With the many advances stemming from GEOHAB-related research, there are still many important questions and HAB issues to be resolved. The final section of this book includes chapters related to the forward-looking issues that may be tackled by the next generation of GEOHAB-like research, GlobalHAB. It is hoped that the global community can continue to advance our understanding of all facets of HAB events and to make an effective progress in managing and mitigating the impacts of HABs on ecosystems and human health.